We have so many relatives that we see over the holidays it is just not reasonable to buy gifts for everyone! But it isn't too hard to mass-produce yummy treats! 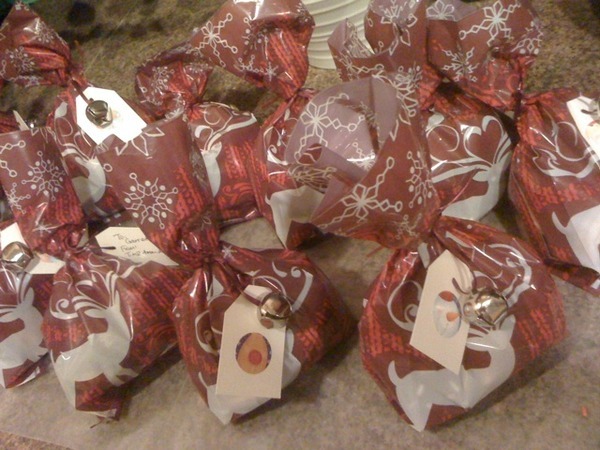 You could just buy some and wrap them in cute bags, but when you make them yourself and wrap them yourself it is a nicer touch that anyone will appreciate. 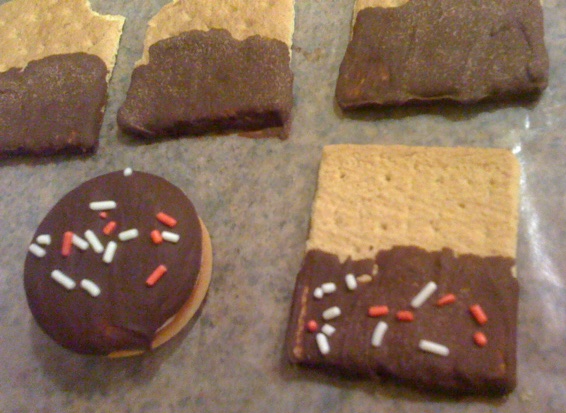 Every Christmas my mom makes chocolate-covered pretzels as gifts, so I made chocolate-dipped Oreos and graham crackers! And then added sprinkles. Some turned out kind of ugly, but they were still TASTY! If I did it again, I would just stick with Oreos; perhaps an assortment of Vanilla and Mint. I found cute reindeer bags and added a tag, jinglebell and ribbon. To make the tags I just cut out the shapes from cardstock paper, punched a hole in the end for the ribbon, stuck a Christmas sticker on one side and addressed the other.